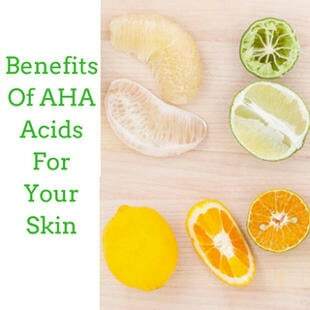 You have probably heard that AHA acids are very good for your skin but in what way? As we age, the normal rate of the skin cell renewal gradually minimizes. In this case, AHA acids help the complexion stay healthy, bright and smooth as long as we use them the right way. Let’s see how! How do AHA Acids Work? Our skin is genetically set to renew itself so that it stays healthy and bright. When new cells are born, they start their long journey to the surface of the skin during which they mature and then they have to be replaced by new ones. Under normal conditions, this whole procedure lasts for about 28 days. Nevertheless, as we age, the skin cells renewal rate reduces and that results in the old skin cells remaining on the skin’s surface for a long period. That is when our skin suffocates, loses its even texture and becomes dry, rough and dull. AHA Acids are perfect at removing old skin cells, revealing a younger, more clear and toned skin. AHA Acids are elements that have a keratolytic function. Well known AHA acids are glycolic acid which comes from sugar cane, citric acid deriving from citrus fruits, malic acid from apples, and tartaric acid which comes from grapes and wine. The difference between AHA acids and BHA acids is that the latter can penetrate the skin deeper. Deep Exfoliation in the Upper Layer of the Skin- Glycolic acid is the most popular and effective AHA Acid. It has strong keratolytic properties and, due to its low molecular weight, it does deeper exfoliation in the upper layer of the skin, removing the dead skin cells easily as well as boosting collagen and elastin production. This results in the visible smoothening out of fine lines and to the evening out of the skin tone. Effective even at low amounts: According to specialists, AHA acid products that we use at home should not contain more than 10% AHA acids. Still, it has been proven that a systematic use of AHA acid products that contain even lower amounts of AHA acids is a totally safe as well as effective way to visibly improve the appearance of the skin. Safe even for Sensitive Skin- ΑHA Acids exfoliate without damaging the epidermal barrier of the skin and that makes them suitable for sensitive types of skin as well. Especially, lactic acid and mandelic acid offer that gentle exfoliation that sensitive skin needs and due to their high molecular weight, they can’t reach the deeper layers of the skin. Good for Adult Acne: The excessive production of sebum together with dead skin cells and grime can lead to the appearance of adult acne. In this case, fruit acids like salicylic and lactic acid, due to their keratolytic and comedolytic properties, can offer mild exfoliation as well as anti inflammatory function that is valuable for oily skin that is prone to acne. In this case, what your skin really needs is a good exfoliator and a cleanser with fruit acids. For a good selection of effective and good quality products, our articles on the best facial scrubs for men as well as best face cleansers for men may be helpful. Mind of Using Sunscreen: AHA acids can cause photo sensitivity when the skin gets exposed to the skin. Therefore, whenever you use AHA acid products and you want to go out, you should wear a sunscreen. Proven to be Effective: AHA acids have been proven to have positive results on the appearance of your skin not only in a period of a month but even in the first couple of weeks of use. The skin becomes brighter, more clear, rejuvenated, smooth and soft. All in all, AHA acids are valuable for all types of skin and especially mature, dry, oily and acne prone.